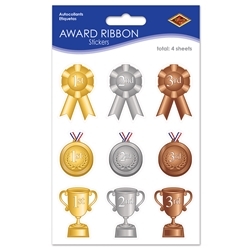 The Award Ribbon Stickers include 4 sheets of 9 stickers featuring 1st, 2nd, and 3rd place ribbons, medals, and trophies. Celebrate your victory with these easy to use stickers. Great as a prize for kids and adults alike – everyone will want to strive for getting the bronze, silver, or gold!